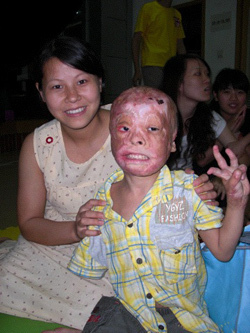 Jin Hui was the smallest boy in his village. Teased and taunted by the older children of his village, and ostracized by his peers, Jin Hui often sought solace in a small wooden shack on the outskirts of town. In this shack, Jin Hui was safe from the insults and torments of the other children; in this shack, he could play and build fantastic imaginary lives for himself. Tragically, Jin Hui's playhouse was not the oasis it appeared to be. Wondering where he disappeared to every day, Jin was followed to the shack by a band of local teenagers. The teenagers, wanting to play a prank on the five-year-old child, set fire to the shack, trapping Jin Hui inside. 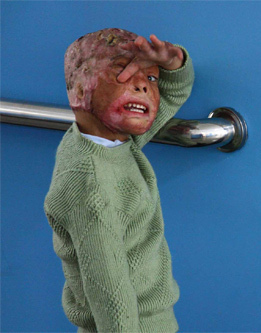 Jin's head, arms, torso, and legs were all badly burned by the blaze. Jin Hui is now in need of facial and ear reconstruction. His fingers and leg are also contracting and stiffening, and he is in great need of a prosthetic for his amputated arm, as well as physical and occupational therapy. Jin's application for care at the Shriners Hospital for Children in Galveston, Texas is currently being assembled.